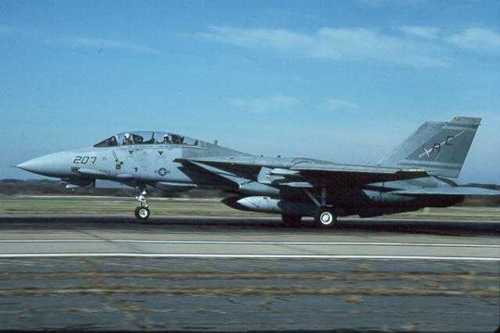 CDR Joseph Bernard Connelly and CDR Leo F. Enright were in F-14 AC207 (AC was the tail code for VF-32 Swordsmen) and LT Hermon C. Cook III and CDR Steven Patrick Collins were in AC204. At 11:50 the two aircraft were informed by a Grumman E-2 Hawkeye Airborne Early Warning (AEW) aircraft that four Libyan MiG-23 Floggers had taken off from Al Bumbaw airfield near Tobruk. The Tomcats turned for an intercept, the first two MiGs were 50 km ahead of the rear pair. The common procedure at the time was to acquire and lock the enemy aircraft with the Tomcats powerful AWG-9 radar, a maneuver that generally ended with the enemy aircraft reversing their course and avoiding an engagement. The Tomcats locked the Floggers from 72 nautical miles away. The Tomcats then turned away from the head-on approach, thus indicating to the Floggers they do not wish to engage in combat. “Warning Yellow weapons hold” was heard over the radio at 11:59 meaning the Tomcats were authorized to fire if threatened. The order to arm the Sidewinder and Sparrow missiles was given by the lead Tomcat’s RIO (Radar Intercept Officer). You can clearly hear him say “Master arm on, Master arm on” followed by “Bogeys have jinked back at me again”. At a range of 14 miles AC207’s RIO launches an AIM-7M Sparrow, surprising his pilot. “Fox 1 Fox 1” was heard over the radio. The missile failed to track so a second missile was launched “Fox 1 again”. If there’s one thing the U.S. military is good for it’s owning the skies. We have what is considered to be the most fearsome air forces of any nation. We own the sky night or day. Well, the Israeli airforce pilots are comparable if not better than US pilots, from what I’ve learned. yeah, those IAF guys are considered the best. About 5 years ago in the USAF vs IAF exercises wich was USAF F18 against IAF F16D’s, the killing ratio was 1 – 26 in Israel’s favor. Check out the flutter on the left vertical stabilizer just after the missel hit as the F14 went inverted. With the exception of the few seconds of black and white gun camera footage at the end of this video, none of the remaining footage is from the actual incident. It’s made up of a montage of F-14 color footage from the 1970’s. Yeah the Isrealis are well trained in small elite numbers, but with the Air Force, Navy, Marines, each provide a unique but different role. You could say that once you are in an elite status, it is not always the how good you are, but also how well your equipment is, tactics, strategy, mission, experience, training. I would say that the Americans fit as their special forces are, playing many different roles, but the US trains many more in a broader field, in greater numbers, & more roles. You must compare apples to apples.